Blood Crescent is a young adult paranormal novel written by author S.M. McCoy, and is the first book in the Divine Series. Crystal Dylan has no idea that her blood holds magic, until she discovers that her dead mother isn’t dead after all, but was kidnapped for the same blood which now resides in her veins. The only way to find out what happened and why is to seek answers from the very people who want to hunt her down now, but Crystal can’t do it without her protectors. Victor, a shifter, has led many lives in the run up to meeting Crystal, in fact so many that her presence throws him into a brand new clarity. As Crystal searches for her mother, she gets a lot more than she bargained for as evil closes in. Crystal’s tale is one of self-discovery as much as it is about shifters and monsters and magic, and that’s the heart which young adult readers are sure to relate to. The story is told with strong perspective and Crystal is well crafted with devotion. On the other hand, some of the other characters only seem to be developed enough to suit Crystal’s purpose rather than being authentic on their own. However, the overall plot is well constructed and reads with excitement in every chapter. 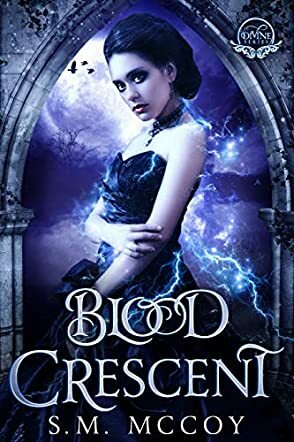 Readers of seminal classics like Twilight, The Hunger Games and Divergent are very likely to eat up Blood Crescent and devour every morsel with relish, and I found it to be an enjoyable read.